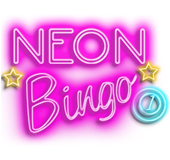 Neon Bingo | Get 300% bonus when you join! 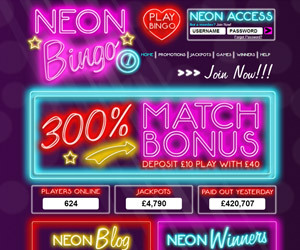 Neon Bingo is a flashy site – in more ways than one! It forms part of the huge network run by Cassava Enterprises of Gibraltar, and is powered by Dragonfish software. 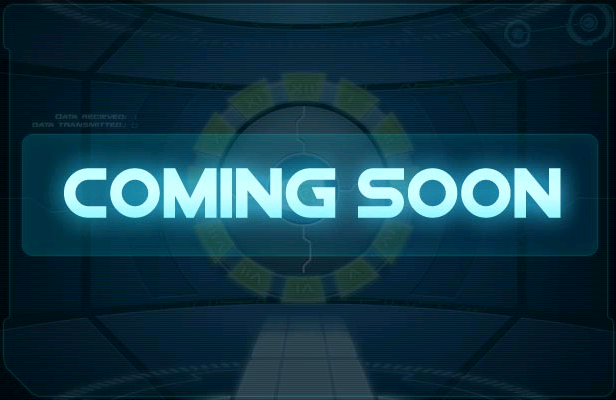 As part of a such a big network, it means you can play with thousands of other players, leading to bigger and better jackpots. Bingo where you can win £1,000,000! On Wednesdays, Fridays and Saturdays Cassava combine their networks to offer bingo games where the top prize is an amazing £1,000,000! To win the jackpot, all you need to do is complete your bingo card within a certain number of balls being drawn. Do so, and you could find yourself an instant millionaire. Neon Bingo is not just about bingo. There are plenty of other gaming opportunities for you. Plus, there's the 300% welcome bonus up to £250 on your first deposit at the site.